For this tutorial, we will use the X1 pin. 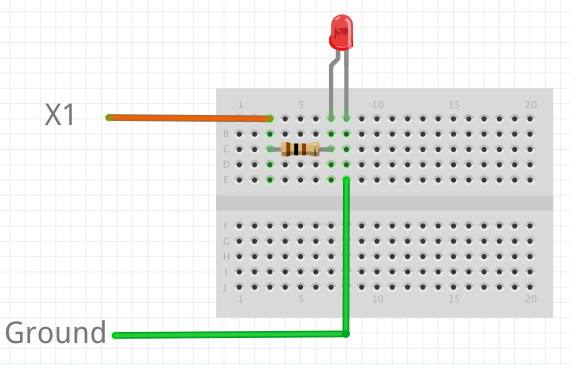 Connect one end of the resistor to X1, and the other end to the anode of the LED, which is the longer leg. Connect the cathode of the LED to ground. Brightness of the LED in PWM is controlled by controlling the pulse-width, that is the amount of time the LED is on every cycle. With a timer frequency of 100 Hz, each cycle takes 0.01 second, or 10 ms.
We could have also used the digital-to-analog converter (DAC) to achieve the same effect. The PWM method has the advantage that it drives the LED with the same current each time, but for different lengths of time. This allows better control over the brightness, because LEDs do not necessarily exhibit a linear relationship between the driving current and brightness.